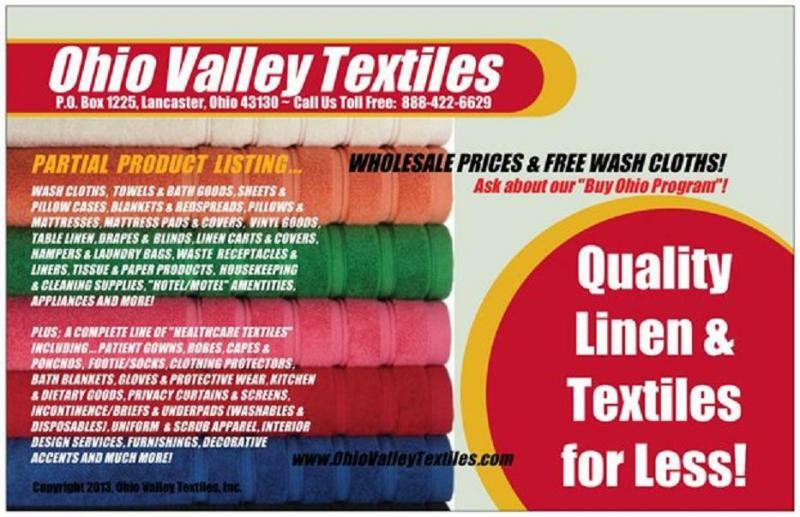 Ohio Valley Textiles - About Us... At Ohio Valley Textiles (OVT) we specialize in "Quality Linen & Textiles for Less" backed by Superior Customer Service that's simply second to none! (See our "Partial Products Listing" on the Products Page of this website.) As you look over the information provided on this website, please remember that we understand and appreciate your position in today's economy. We know that budgets are tight and we often find ourselves "Borrowing from Paul to help Peter - just to make ends meet!" So, unlike some competitors that sell only by the case, the vast majority of our products are sold by the "dozen" (many in eaches) and you'll still get the "same" low, wholesale case or bid prices! ﻿ Please consider the following information when choosing a linen supplier... Many of our competitors seem to be "Jacks Of All Trades" and in some cases, masters' of none! In otherwords, they do not specialize in just linen and textiles alone - like we do! Unfortunately, this means you may be paying more for your products! Worst yet, you may be required to buy some or all of your products by the case, which really blows your budget! At OVT we "specialize" in linen and textiles only! We do not sell medical supplies, prescription drugs, hard-line janitorial products, or car tires and batteries! We are recognized by the mills as the best possible distribution source for their products. This relationship alone translates into savings for you! And, you don't have to be a member of a buying club to get a better price from us! As an OVT customer, we are constantly negotiating and working on your behalf with both the U.S. (Domestic) Mills and the International (Foreign) Mills to help keep prices down. As one customer stated, "OVT is like being a member of an elite buying group, but without all the hassles, contracts and extra costs!" At OVT, we're also advocates in bringing textile manufacturing (jobs) back to America and we support the existing U.S. mills every way we can. Beck's Classic is one of the many U.S. mills we represent. They manufacture washable/reuseable incontinent products of the highest quality and standards in the industry. Call us today for more information on their excellent "Made-In-America" products. "Try it, before you buy it!" Before you buy anything else, let us send you free samples of the products we offer. That way, you can try them out before you buy them! (Free samples and/or swatches are available on all of the linen and textile products we handle!) But, that's not all! 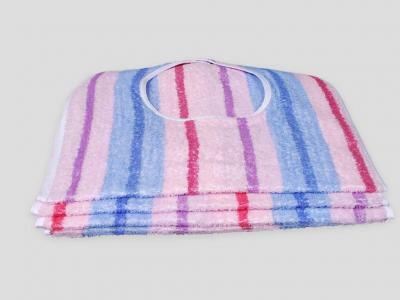 Most of our customers are always in need of wash cloths, so we've come up with a little bonus! When you call us, we'll show you how to get "FREE WASH CLOTHS" not just once, but every time you place an order! Just another way we're saying "thank you" to our valued customers! ...Thanks for reading! PS: Here's something you may not know... If you're currently under contract to another supplier, please be aware that some contracts "automatically" re-new themselves on their anniversary date... Before you have a chance to shop and compare! So, if you're under contract, please contact us now "before" this happens! IMPORTANT... We have a "new" website coming!! So, please check back with us again in the near future or give us a call now - today! ...Thank you! As you look over the information provided on this website, please remember that we understand and appreciate your position in today's economy. We know that budgets are tight and we often find ourselves "Borrowing from Paul to help Peter - just to make ends meet!" So, unlike some competitors that sell only by the case, the vast majority of our products are sold by the "dozen" (many in eaches) and you'll still get the "same" low, wholesale case or bid prices! Many of our competitors seem to be "Jacks Of All Trades" and in some cases, masters' of none! In otherwords, they do not specialize in just linen and textiles alone - like we do! Unfortunately, this means you may be paying more for your products! Worst yet, you may be required to buy some or all of your products by the case, which really blows your budget! At OVT we "specialize" in linen and textiles only! We do not sell medical supplies, prescription drugs, hard-line janitorial products, or car tires and batteries! We are recognized by the mills as the best possible distribution source for their products. This relationship alone translates into savings for you! And, you don't have to be a member of a buying club to get a better price from us! As an OVT customer, we are constantly negotiating and working on your behalf with both the U.S. (Domestic) Mills and the International (Foreign) Mills to help keep prices down. As one customer stated, "OVT is like being a member of an elite buying group, but without all the hassles, contracts and extra costs!" At OVT, we're also advocates in bringing textile manufacturing (jobs) back to America and we support the existing U.S. mills every way we can. Beck's Classic is one of the many U.S. mills we represent. They manufacture washable/reuseable incontinent products of the highest quality and standards in the industry. Call us today for more information on their excellent "Made-In-America" products. But, that's not all! Most of our customers are always in need of wash cloths, so we've come up with a little bonus! When you call us, we'll show you how to get "FREE WASH CLOTHS" not just once, but every time you place an order! Just another way we're saying "thank you" to our valued customers! PS: Here's something you may not know... If you're currently under contract to another supplier, please be aware that some contracts "automatically" re-new themselves on their anniversary date... Before you have a chance to shop and compare! So, if you're under contract, please contact us now "before" this happens! We have a "new" website coming!! So, please check back with us again in the near future or give us a call now - today! ...Thank you! Copyright 2013 Ohio Valley Textiles. All rights reserved.